Reason: When you install cumulative update 7 for Microsoft Dynamics AX 2012 R2, the Data Import/Export Framework appears to be installed for members of the System Administrators role. However, the binary components of the framework are not present. This post describes how to troubleshoot issues with a Data Import/Export Framework installation from InformationSource. After you install the Data Import/Export Framework, if you cannot compile, validate that the Data Import/Export Framework was installed correctly. 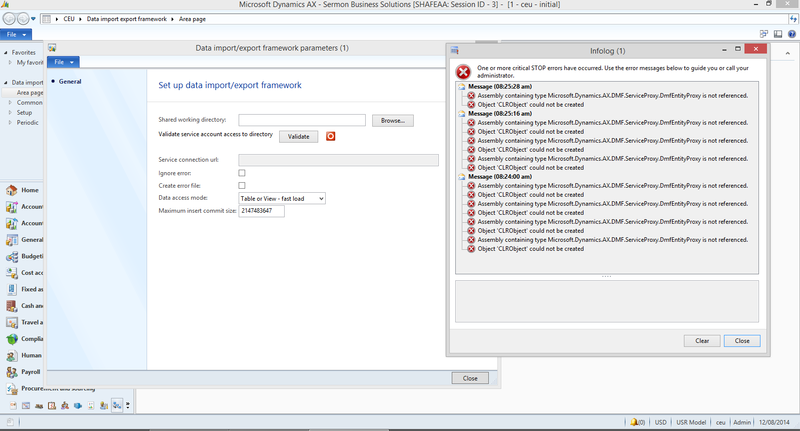 Verify that the Microsoft Dynamics AX Data Import/Export Framework service is running. Copy the DLLs from the installation location (C:\Program Files\Microsoft Dynamics AX 2012 Data Import Export Framework Client Component) to the C:\Program Files (x86)\Microsoft Dynamics AX\60\Client\Bin folder. Copy the .xml and the config files from the installation location (C:\Program Files\Microsoft Dynamics AX 2012 Data Import Export Framework Server Component) to the C:\Program Files (x86)\Microsoft Dynamics AX\60\Server\Bin folder on the server that is running the AOS instance. If you have to update the location where you run Integration Services and the Data Import/Export Framework service, you can update the endpoint address in the Microsoft.Dynamics.AX.DMF.ServiceProxy.dll.config file to use the new server name. The Microsoft.Dynamics.AX.DMF.ServiceProxy.dll.config file is located in the C:\Program Files (x86)\Microsoft Dynamics AX\60\Server\Bin folder on the server that is running the AOS instance. I think this topic is very useful with AX new Implementation and all points mentioned here should be taken into our consideration.